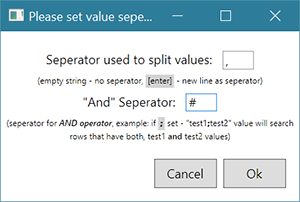 By setting the "AND" seperator, it's possible to search for values that contain more than one value. Displayed will be the rows which contains the value "Test" and "cm" and the rows which contain both values "Search" and "img"
The table explorer allows to look through the data stored in the tables, it contains several utilities to make it easier to filter the data or build complex where clauses. It's also possible to freely edit the sql query, and to make changes in the row data and commit the changes. With the structure comparer we can select two database and generate an overview of the differences in the structure of the two selected databases. The overview contains information about the structure differences, as well as functions to migrate the differences from one database to other. The data comparer analyzes all tables in two databases and makes an overview in the differences between the data contained in the rows of the tables. It allows to generate a merge query which will insert, update or delete the rows with data from one database into another. We can either select the merge direction for all selected tables, for single tables, or whole rows. It's also possible to select, if DELETE statements should be included in the query for rows that exist only in one database. After we select the rows and/or tables for which the merge query should be generated, we can have a look and analyze the generated query.